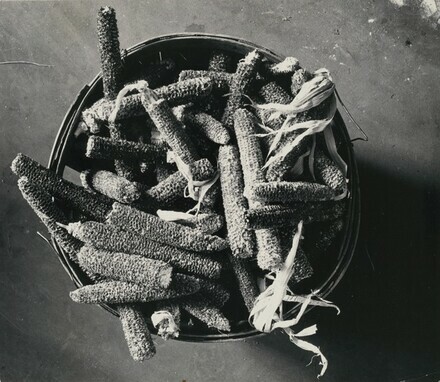 on verso, signed by artist, bottom right in graphite: Wright Morris; by unknown hand, top left in graphite circled and crossed out with blue pencil: 3; top left in blue pencil: 68; top center printed in black ink on applied label: and corn on the cob, is the staple food, and then the staple fuel. Cobs / are also known to serve for other purposes on a dirt farm. Morris, Wright. The Home Place. New York, 1948: 131.